Starring Jesse Eisenberg, Alexander Skarsgård, Michael Mando, Salma Hayek, Sarah Goldberg, Anna Maguire, Frank Schorpion, Johan Heldenbergh, Kwasi Songui, Ayisha Issa, Mark Slacke, Conrad Pla, Julian Bailey, Jessica Greco, Robert Reynolds, Wyatt Bowen, Ryan Ali, Amanda Silveira, Kaniehtiio Horn, Anton Koval, Adam Bernett and Trinity Forrest. Distributed by The Orchard. 111 minutes. Rated R.
Despite what some politicians may try to convince you, the American economy is a mess. At least it is if you don’t have billions to prop you up, because income disparity is at insane “let them eat cake” levels. The middle class has been slowly, systematically eradicated ever since the Reagan years. And it mostly has to do with guys like the ones in The Hummingbird Project. 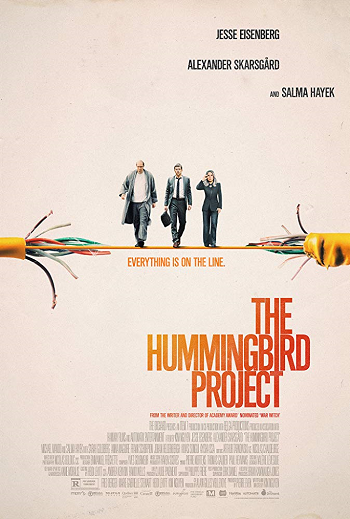 The Hummingbird Project is the latest in a series of films about white collar criminals going to extreme measures to cheat and steal their way to massive wealth, without once considering the damage they are causing with the rest of the world. At least Hummingbird has the good sense to look at these people with a certain amount of disapproval – to a certain extent films like The Wolf of Wall Street and The Big Short almost made this kind of graft look rather glamorous. There is nothing glamorous about The Hummingbird Project. It is dirty, squalid, ugly, desperate and detached from humanity. And honestly, it’s often pretty dull. In fact, technically, when you get down to it, The Hummingbird Project is two hours spent watching people digging trenches, laying cable line and obsessing over computer code. Of course, there is more to the scam than just that. People go to insane measures to work out this convoluted plot; blowing millions of dollars, spending weeks crunching numbers, doing manual and intellectual labor, bribing and intimidating land owners, dealing with corporate subterfuge, potentially going to jail, even ignoring possibly terminal cancer. And why do all this? To get an advantage of a percentage of a millisecond – the time it takes for a hummingbird to flap its wings – in the stock market. If you can’t make money legally, cheat. What a lovely moral for the Trump era. This bottomless hunger for wealth and power doesn’t even make sense. As mentioned above, one of the characters is doing against doctor’s orders and ignoring a probably deadly case of lung cancer just to finish the project. What good does it do you to be insanely rich if you are also dead? Of course, that is writer/director Kim Nguyen’s point, I believe. The cancer is a physical symbol of the characters’ moral malaise. Which doesn’t make the movie any easier to watch. The problem is there are very few people anyone will like in The Hummingbird Project. These people are to blame for their problems, their insatiable greed has caused every bump in their roads. The two main characters are brothers. The alpha is Vincent (Jesse Eisenberg), a low-level Wall Street trader who goes rogue when he realizes that he could gain that brief advantage in time if he builds a perfectly straight cable line from Kansas to New York. Anton (Alexander Skarsgård) doesn’t so much care about money. He’s more interested in the intellectual exercise. He’s a hacker and just wants to prove that he can do it. However, when a hotel waitress – one of the few likable people here – points out that their pursuit of wealth is cutting out the people who are actually providing the goods, Anton is flummoxed. They are not a part of the paradigm he explains to her. Only eventually, after multiple problems, dangers, arguments and mini-disasters, do the brothers realize maybe everyone is part of the paradigms, after all. Plus, their viperish ex-boss (Salma Hayek with a stylish gray-streaked hairdo) is moving heaven and earth to make sure they do not succeed. There is some terrific acting here, but the film itself is rather dull. It has some intriguing ideas, but for the most part it doesn’t quite seem to know what it wants to say, or how it wants to say it. Copyright ©2019 PopEntertainment.com. All rights reserved. Posted: March 22, 2019. Tags: Adam Bernett, Alexander Skarsgård, Amanda Silveira, Anna Maguire, Anton Koval, Ayisha Issa, Conrad Pla, finance, Frank Schorpion, hummingbird, Jesse Eisenberg, Jessica Greco, Johan Heldenbergh, Julian Bailey, Kaniehtiio Horn, Ken Nguyen, Kwasi Songui, Mark Slacke, Michael Mando, middle class, Robert Reynolds, Ryan Ali, Salma Hayek, Sarah Goldberg, stocks, The Big Short, The Hummingbird Project, The Wolf of Wall Street, Trinity Forrest, wall street, Wyatt Bowen. Bookmark the permalink.